MUSIKMESSE 2015: Eve Audio has announced a new set of desktop monitors, dubbed the SC203. The speakers are designed to deliver the best sound within a confined space and are being marketed at both music-makers and gaming users. The speakers combine a three-inch woofer and a one-inch voice coil, each powered by a 30 watt amplifier. They can also be mounted in a variety of ways, including on 3/8" thread mic and speaker stands, wall mounts or with a FlexiPad base to angle them at 0°, 7.5° or 15°. When a small footprint - but a big sound! 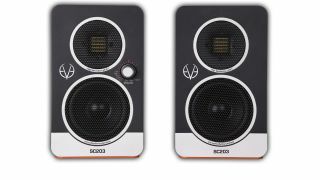 - is what you're looking for, the SC203 becomes one of those few examples where small also means powerful. It took a very diligent work by our team of EVE Audio engineers, along with the best high quality components, to guarantee the best performance and high resolution from such a small profile set of speakers. To further extend its flexibility, each speaker is provided with the FlexiPad, a v-notch shaped orange rubberized pad that allows you to decouple the speaker from its base and angle it precisely at 0°, 7,5° or 15°. Accessories include our SC203 Mounting Adapter, which enables you to mount your speaker directly on any microphone or speaker stand that features a 3/8" thread. And why not combine it with our threaded wall mount adapter, and place your speaker directly on a wall, where it may be more convenient for your own space? The SC203 Mounting Adapter even makes good use of the included FlexiPad: by placing the FlexiPad between the speaker and the mounting adapter you are further decoupling unwanted resonances, and can even better arrange orientation for upright positioning at 0°. As expected, all necessary mounting screws are included.